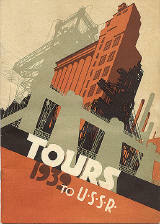 Travel brochure "Tours to the USSR 1932." Signed "A. Salensky '31." 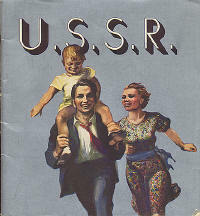 Travel brochure "Besuchen Sie die UdSSR," circa 1937. Socialist Realism takes over. 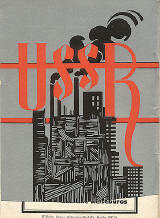 Travel brochure "Seeing the USSR," circa 1930. 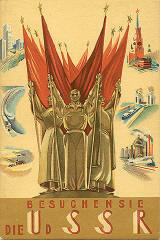 Travel brochure "USSR," 1936. A heavy does of Socialist Realism. 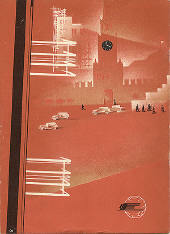 Travel brochure "Unsere Reisen 1930." Front cover. 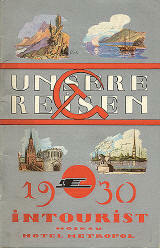 Travel brochure "Unsere Reisen 1930." Back cover. 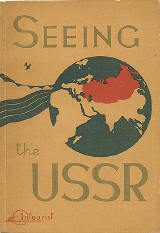 Travel brochure "Seeing the USSR," circa 1933. Front cover. Designed by Nikolai N. Jukov (thanks to his daughter for this identification - 2009). 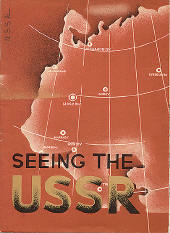 Travel brochure "Seeing the USSR," circa 1933. Back cover. Designed by Nikolai N. Jukov (thanks to his daughter for this identification - 2009).